When it comes to survival knives, there are many options to choose from. Dozens of companies are vying for your money, promising that their knives will keep you safe in a survival situation. But do they live up to the hype? In most cases, the answer is sadly no. However, there are a few gems that stand out from the crowd. I’ve written a guide on how to choose the best survival knife in the past that you may want to look at if you’re in the market. 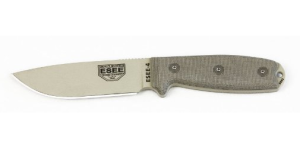 But today I want to share just one of those gems that I found while doing research on survival knives: The ESEE 4. I’ve looked at ESEE knives before, most notably the ESEE 6 survival knife (which is the 4’s longer bladed brother). And without exception, their blades have been of the highest quality survival knives that I have seen. Their steel quality, blade sharpness, and overall feel are among the best knives I’ve seen in their price range. ESEE is an American company located in Alabama, and it is owned entirely by two people. They test their knife designs to the extreme before they go into production, and only release the best performing blades. All of their knives definitely have the quality feel you expect from a small American company. With all of that said, the ESEE lived up to its brand’s hype. 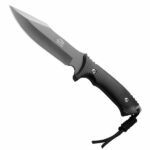 It is a solid knife with some great features and characteristics that would be incredibly useful in any outdoor activity/survival scenario. It is a very thick, sturdy knife with a 4.5″ blade. 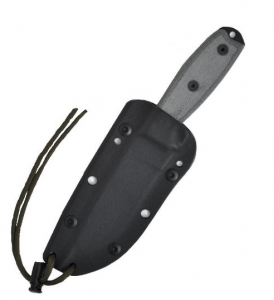 While that is relatively short by the standard of many survival knives, it makes it uniquely portable and maneuverable in tight spaces. Admittedly, this short blade did make it harder for me to fall in love with. Because the knife is decently hefty and has a thick blade, I think the longer blade of the 6 might be a better fit for most survival situations. However, for some people, that blade length is perfect. It all comes down to personal preference. 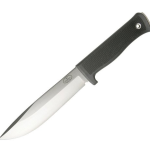 The knife comes with a sturdy plastic sheath that is of surprisingly high quality. I expected it to be cheap like most similar sheaths, but I was pleasantly surprised to find it extremely rugged, and it held the blade perfectly. It has two separate pieces: The main sheath that the knife goes into, and a detachable belt clip. This allows you to move the clip to the other side, depending on which side of your body you will be carrying the knife on. The blade is without a doubt the best part of the knife. It is made of 1095 57-Rc steel, and is razor sharp. It is coated to prevent rust, it is a very thick, sturdy blade. I seriously think it would take being run over by a tank to bend this blade! I ran a few basic tests with the blade, and it performed admirably. Compared to many other fixed blade knives, the ESEE stands apart in terms of blade quality. 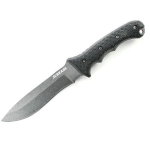 All in all, this knife is definitely on my short list of knives to make it into my bug out bag. While I think a longer blade (like that on the ESEE 6) would meet my tastes better, and it is more expensive than many survival knives available, I definitely don’t hesitate to recommend that you check this knife out. 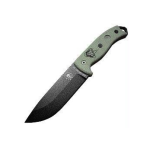 You can buy the ESEE 4 on Top Spec US online at any time!